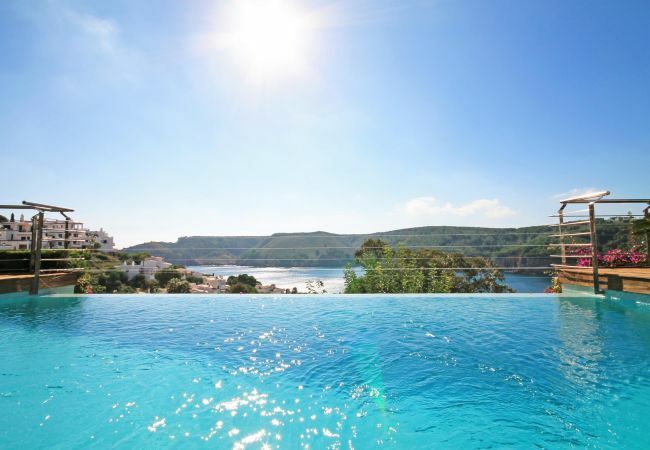 This amazing villa with private pool and magnificent views is situated in Cala Montgo, a privileged enclave on the Costa Brava, surrounded by ancient cultures and beautiful landscapes. The spacious living room, the kitchen, and two of the four bedrooms have wonderful views of the sea. The garden and the wonderful pool, which gives you the feeling of hanging over the sea, invites you to spend good times with your family and friends. The villa has panoramic views of the Montgrí Natural Park and the beach of Montgó. This is one of the most beautiful on the Costa Brava. In addition, this beach offers magnificent walks through the Montgrí Natural Park. The road to the beach is only 450 meters away. The house has several large terraces, garden and private pool. Outside the house you will find tables with chairs, loungers, and everything you need to enjoy the holidays. About 500 meters from the house there are restaurants, bars, shops and a supermarket. In total in the villa can sleep 8 people (2 double beds and 4 single beds). 2 TVs, garden, garden furniture, terrace, fireplace, iron, internet (Wi-Fi), hair dryer, balcony, 200 m² property, pet-friendly, electric heating, air conditioning in the living room and in some bedrooms, private swimming pool. Excellent stay, villa with stunning view and great outdoor area. Spacious villa with stunning view. Great outdoor area with nice pool, loungers-beds, eating and sitting area. Family of 5 adults traveling together and rooms, bathrooms and common areas such as kitchen and living- and dining area were well suited. Lots of closet space. The villa is located high up on hilly ground and out-of-the-way, but in return you have an amazing view and a fantastic outdoor area. Toilet and bathroom downstairs have no place to hang towels, same issue in the kitchen. We were there end season and many restaurants and shops were closed for winter. Quite far from supermarket etc. so a car is a must. Kitchen and bathrooms could do with a thorough cleaning. Staff at K3Homes had limited English skills and we had power failure during heavy rain and communication by phone were a bit challenging. Stairs were high and steep to get to the front door ! Der Blick auf die Bucht von Cala Montgo ist einfach toll. Der Aufstieg von der Bucht zum Haus führt über eine Treppe und ist gut machbar.